The summit of the hill of the Poggio alla Croce, the site of present-day Radda, was already inhabited by the 11 C BC and remains of stone houses and pottery found there indicate the presence of an Etruscan population from the 6 C BC until the 2 C AD. During the 5 C, the Roman empire succumbed to the Barbarian invasions. At that time, the Chianti area supported no more than villages - Radda, Monte Rinaldi, Volpaia, Castelvecchi - mostly very small villages of only five or six houses. During the 9 C and 10 C, feudal society established itself and the Chianti region, in the possession of the Counts of Guidi and the Marquis of Tuscany, began to prosper. Radda grew in size and population. By 1100 Radda (the name "Ratta" appears in an edict of the Emperor Otto III from the year 1003 and later on in 1041 in the form of "Ramda") was the most densely populated and, second only to Ricasoli, the most important of the communities in the area. From its earliest origins until 1500, Radda found itself in the middle of the conflicts between the two most important cities in Tuscany, Florence and Sienna, which were in interminable conflict over their frontiers. In 1250, the Florentine Republic divided the communities into districts, allotting each a certain amount of territory and together forming the Lega, the Chianti League. 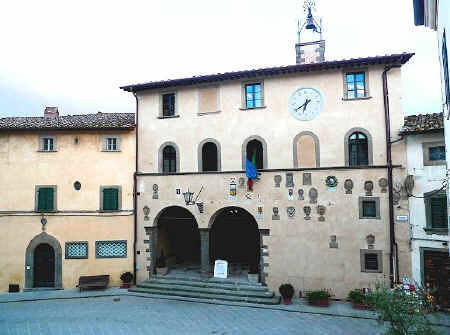 From 1384 on, Radda was the seat of the podestà, the chief magistrate, and the oldest statute of the Lega del Chianti, dates back to that year. The old, historical Lega del Chianti ceased to exist in 1774 when the three counties of Radda, Castellina and Gaiole were constituted. The history of Radda, like that of the whole Chianti area, was always linked to that of Florence and Sienna and their continuous struggle. It was not until 1550, when Florence finally vanquished Sienna, that the town could begin to breathe the air of peace and tranquility. The 17 C has been defined as the "Chianti Century" because of the reputation the Chianti area earned with the wine it had been exporting to England since the mid 16 C. It was also during this century that a loose form of agricultural organisation began to build up. The fattorie, the landed estates, were born and the owners built elegant villas whither they came to spend the summer in the country - for example, the Strozzi and Pazzi families of Florence, to name only two. The town hall, constructed during the 15 C, was completely destroyed by the Aragon invasion in 1478. In 1700, the reconstructed building was enlarged by the addition of the second storey and the prison. It has served the Community of Radda as magistrate's office for more than four centuries. Coats of Arms of local families cover the outside facade of the building. Today there are 51 of them, three dating back to the 15 C, 25 to the 16 C, 16 to the 17 C and 7 to the 18 C century. Directly underneath the sandstone arcade is the Coat of Arms of Francesco Ferrucci, chief magistrate of Radda in 1479. On the first floor there is a recently restored fresco of the 16 C Florentine school. The mezzadria, the share-cropping system in which the farmer brought in his and his family's labour while the proceeds were divided with the owner, spread out more and more. The mezzadria dominated the agricultural landscape until the 20 C, and was in fact not officially abolished until 1967. At the end of the 1950's, the Chianti area also experienced a period of land desertion by the farmers, as did many other parts of central Italy. During the 1970's, though, the rediscovery of the Chianti region took place. The wine and olive terraces gave way to a larger and more intensive wine-growing cultivation, changing the face of the pleasantly rolling hills, and a large group of Chianti admirers bought and restored the former farmhouses. The convent Santa Maria al Prato originated in the Middle Ages, even though the main building and the adjoining convent today appear to be more 18 C. More or less complete restoration did in fact take place during that period, accounting for the neo-Romanesque oratory. 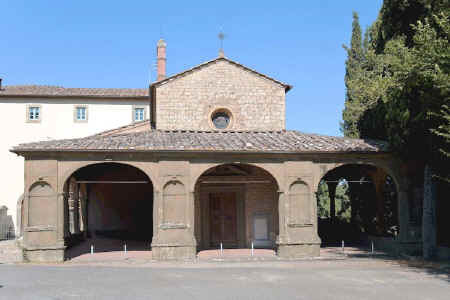 In 1415 the convent was listed among the peoples composing the Lega del Chianti. During the 15 C, the church also acquired a very valuable work of art, the "Madonna con bambino tra i santi Niccolo, Giovanni Battista, Maria Maddalena e Antonio Abate" by Neri di Bicci and dated 1474. In 1708 the oratory was donated to the Padri Riformatori, the Reform Fathers. The convent existed until 1866 when it was abolished by the national government. In 1935 the complex of Santa Maria in Prato was bought from the Province of Tuscany by the Sacre Stimmate dell'Ordine dei Frati Minori, a Franciscan order residing there until 1974. 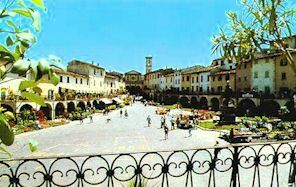 For your country accommodations in Chianti - stay in the cool Chianti hills - B&B rooms, apartments with pool. Check our Greve in Chianti farm house holiday rentals.